Screenpresso captures your desktop ( and HD videos) for your training documents, collaborative design work, IT bug reports, and more... Light-weight Windows screen grab tool with built-in image editor, user guide generator and sharing options. Capture full screen, part of the screen or a specific window with the same shortcut. 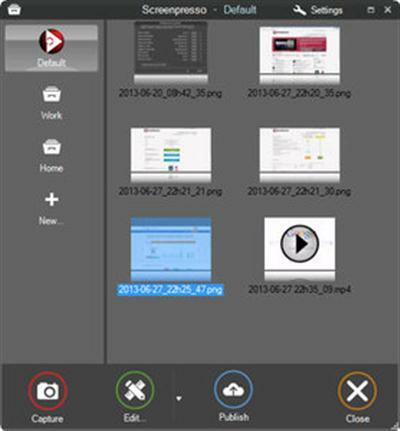 Record your screen in video (MP4, WebM, WMV, OGG) and export in HTML5. Can't fit it on the screen ? Make a unique image thanks to the stitching mechanism. Crop, spotlight an area or comment parts of a captured image, add drop shadow, rounded corners, reflection and more. Don't bother to save or videos on your drive, Screenpresso does it for you. Easily share your via Evernote, Google Drive, Twitter, Facebook, G-Mail, Flickr, Minus, Dropbox, Imgur, ImageShack, Hightail or FTP. Quick send your screen capture on YouTube HD to create screen cast.